Artist Michael Griesgraber knows how to make color go through its paces. 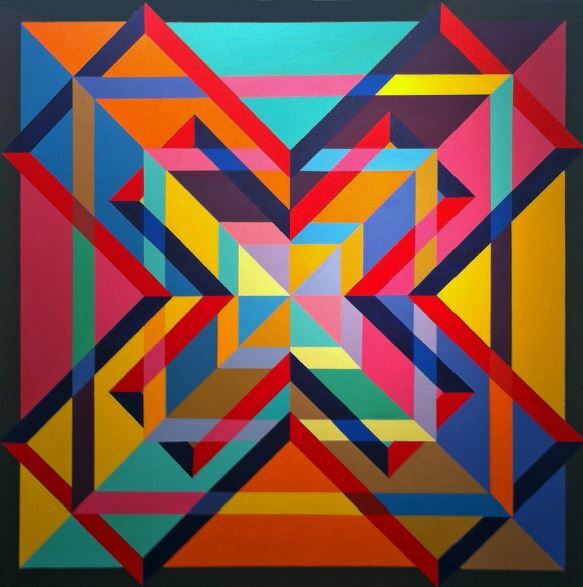 In his hard-edge geometric paintings, he opts for saturated hues that contest with one another for visual prominence, resulting in dynamic configurations that perpetually realign. Calling upon the variable perception of a color in relation to others, he masterfully orchestrates ever-shifting groupings and spatial readings, with any component having the capacity to advance or recede. For the mutable ordering of surface and depth to be set in motion, each color must hold its own, and Griesgraber’s palette has muscle. The exhibition title Colors Square Route references the format for all the paintings. Starting with the canvas shape, squares and cubes are used throughout as a motif and as overt or implicit structural elements. In addition to the lines of 90° angles, Griesgraber derives diagonals and with this restricted repertoire achieves seemingly endless permutations, pushing patterns to the limit with the adept application of vibrant color. In emphasizing the grid’s significance in modern art, Rosalind Krauss cites the “lateral spread of a single surface,” which insistently distinguishes the painting-as-object from illusion. After years in advertising, Griesgraber is versed in the grid as a typographic and layout tool; but in these paintings, it becomes a means of gaining full-on physical and visual impact as well as creating tension between freedom and constraint. His paintings have a commanding gestalt that is an overwhelming burst of color. Individual delineated elements surrender to the overall effect, while drawing attention almost simultaneously to areas within the painting. The back-and-forth from part to whole itself enhances the eruptive energy, which makes it seem as if the design might extend beyond the confines of the rectangle. Yet this centrifugal movement is often countered with centripetal. Many compositions have a center point that is the product of intersecting coordinates, which beckons the eye inward while peripheral intrigue diverts. Directional lines, bands or blocks of color, and concentration of details can at times turn the center into a vortex or alternately a projection, either of which defies the strictly two-dimensional. What was immediate and totalizing becomes elusive and open-ended. When Griesgraber favors centrality, the painting can suggest a brightly colored mandala, the Buddhist and Tantric Hindu meditative cosmogram that guides one through the processes of disintegration and reintegration — one into many and many into one. At times the artist uses the central axis as a point of departure, working with asymmetry and randomness to enliven and to captivate. Seemingly Griesgraber provides the signals for the mind to find resolution, but his delightful deviations and skilled aesthetic maneuvers never quite allow inference or interpolation. Chaos is always nipping at the heels of order. Characterized by degrees of complexity, Griesgraber’s arrangements of robust color in different-sized geometric shapes convey rhythms and tonal harmonics. At the end of the nineteenth century, Symbolist artists found correspondence in the intervals of musical notes and of hues on the color wheel, which supported a more affective approach to art. Developing an abstract vocabulary to embody his theosophical beliefs, Kandinsky went so far as to assign certain sounds to certain colors. Without being systematic, Griesgraber likewise finds an emotional equivalence between color and music. In his studio listening to an eclectic mix from Dylan to Sinatra to Coltrane to Stones, he allows himself to be open to the selection and placement of a particular color, rather than mechanically carry out a preconceived or precise plan. Responding to the developing auditory and visual mood, Griesgraber lets what he calls “the melody” take form through the act of painting. Combining improvisation with deliberation, he digs into a deep well of understanding about the behavior of color — how it is seen. Two of the most influential artist-theorists, Hans Hoffman and Josef Albers, were heirs to those who compared operations of music and color. While recognizing distinctions, both men alluded to ways in which both modes of expression created effects and elicited emotion through relationship. 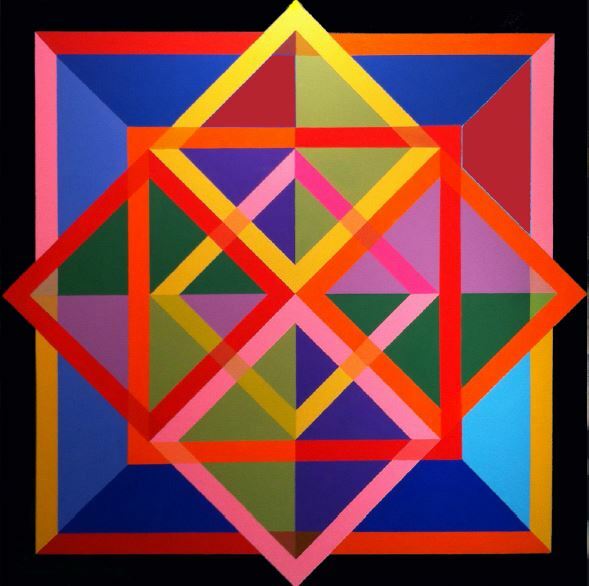 In his masterwork Interaction of Color, Albers contends, “As with tones in music, so with color — dissonance is as desirable as its opposite, consonance.” Rather than possessing properties in itself, color as a component of art is relative and, as such, protean, capable of varying intensity, temperature, vibration, and position in space. Griesgraber employs Hoffman’s principle of push/pull and Albers’ theories of contrast to create dazzling optical puzzles that reside on multiple planes. In carefully devising the title Colors Square Root, he put together three words with a basic syntax in which puns, multivalence, emphasis, and context could hint at his play with color and composition, which are strategies somewhat analogous to his artistic modus operandi. Beginning with the intuitive selection of his first acrylic pigment, Griesgraber builds upon each successive one through principles entailing repetition/divergence; juxtaposition/separation; complementary colors, including makeup of primary within secondary colors; tonal range and brightness. For all his expertise, at heart Griesgraber remains the boy who couldn’t wait for the 64-color box of Crayolas. 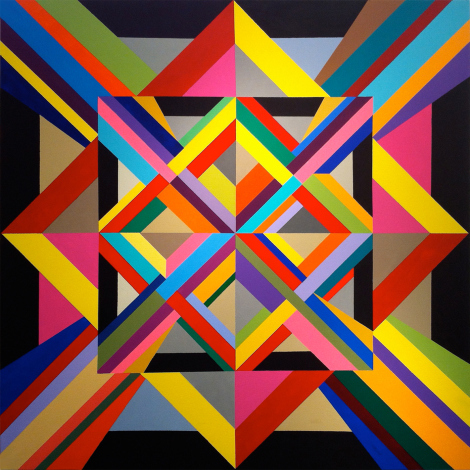 In his painting Twelve Squares, the artist appears to offer a variation on the theme of the square, in which the stable geometric shape is set off by the diamond orientation; but what initially seems clear-cut becomes increasingly ambiguous. The longer one looks, the more complicated the tangle of forms appears, as the consistency of bands within the red family is not maintained but is tweaked by the addition of yellow to green hues. Because certain areas share the same colors, are they part of the same square, or are they distinct rectangular overlays? Griesgraber creates the illusion of transparency, which makes the enigma of what goes with what even more dizzying. As blues and purples fill in spaces both logically and arbitrarily, one resolutely bright turquoise trapezoid acts as a foil to the entire chromatic field as well as a willful digression from any overarching objective or fixed experience. 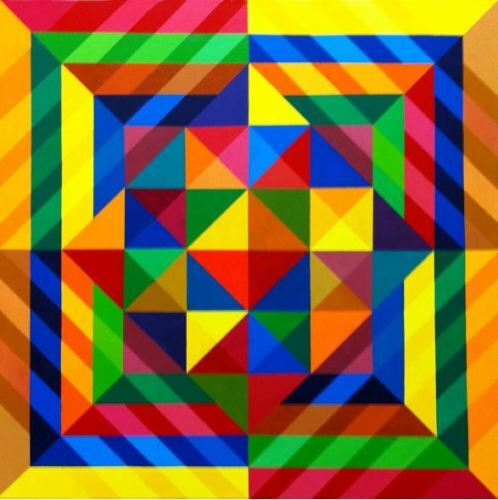 Although his hard-edge geometric aesthetic might be easily and quickly executed by computer, Griesgraber insists that his artwork be “clearly hand-painted, not machine made or mechanically reproduced.” The sensuous tactile quality and richness of his pigments touches and rouses the viewer in a way distinct from digital inks. Beholding the paintings of Color Square Route involves visceral sensation as well as the mind’s interpretation of information from the eye. Griesgraber’s bracing colors have an unmitigated power that acts upon the body without any intellectual processing, especially given his forceful high-vibration choices. One simply imbibes them. In giving his colors a workout, the artist triggers the act of perception in the viewer, and this is where things really take place. Whatever gradual unfolding or rapid sequencing is visible or felt, the particular animation, reverberation, reshuffling, reversal, illumination, radiance is an optical effect that requires someone to see the painting — to scan with their eyes and interpret with their brain relying on memory, learning, and expectations. Viewers are charged on more than one cylinder, and the seeing/feeling cocktail of sensory stimulation is exhilarating. If Griesgraber’s paintings leave one spinning, it is much as in the songs in which a lover never wants their disoriented rapture to end. The artist provides unabashed pleasure in his selection of colors at their most succulent, his embrace of color’s indeterminacy, and in his tantalizing deferment of visual closure.